١- پێدانی بڕوانامە بە مامۆستای یانەكان. ٣- سوپاس و پێزانین بۆ خۆبەخشەکانی گۆشەی ئەمریکی بە شێوازێکی جیاواز. ٥- ڕەنگ كردنی دەم و چاوی منداڵان . 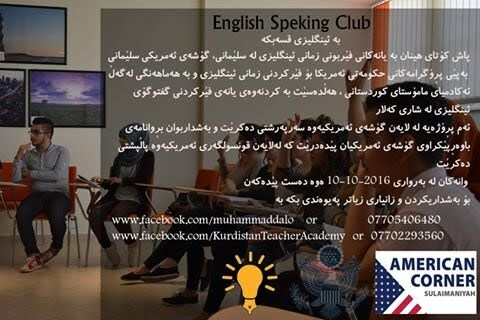 American corner Sulaimaniyah for the first time is going to hold a big celebration for our (Speaking, Writing and Reading) club students . Education USA advisor from US consulate -Erbil will be a part of this event ,the below activities will enrich our celebration. 1- Distributing Appreciation certificates to our club tutors. 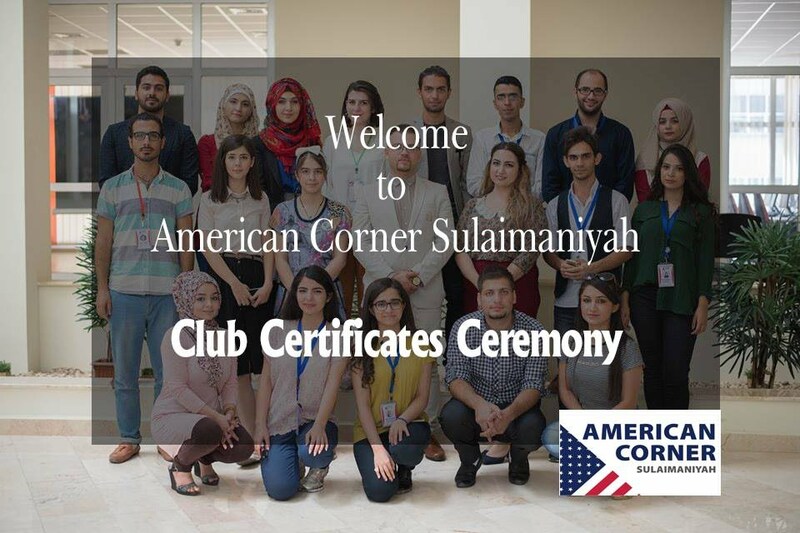 2- Distributing Completion certidicate to our Club students. 3- Appreciating American Corner's Volunteers in a different way. 5-Face painting for our beautiful children gusts. Please share this event with everyone,it's an open day for everyone. American Corner started doing placement tests of English Clubs (Speaking, Reading, and Writing ) , from 9:30 to 5:00 pm. Registration for the three English Clubs: Speaking, Reading, and Writing. An English Club is a place for language learners to use English in a casual setting. Practicing your skills in the classroom is important, but it is not like real life. In the classroom, you often focus on one skill and one item (for example: grammar - future tense). Three Days of English for University of Sulaimaniyah Employees. During these three days we tried to recall some English tenses and small tips about English grammar for refreshing their memories. In these three days we could do some activities that can help them have a courage to use English as much as possible, such as playing games ,even we got benefit from a visual aids to make the classes more effective. This English club was more advanced than the previous one, the attendances were English Teachers from both Typical primary Schools Jihan and Rose. In the very beginning of this lecture we started with asking them how to learn English? and how to make the learning procedure fast and more fun? Then we took their notice to match them with our tips. The second part we did was fish table game, this game was like a brain storming we gave a topic and they started giving their ideas and arose the topic. Finally, the last day we did an academic debate with pros and cons. The second day of this English Club was with our Guest Mr. Jeff the AUIS instructor. He did some activities in order to enrich the lecture. His lecture has been divided into two parts; The first part, he used the Dice technique; each dice has its picture that you have to explain what is the dice’s drawing about? It was a nice technique to make them talk; His second part, was about giving the attendance some useful sites and instructions about learning English.